Thenumber of planets that astronomers have discovered orbiting distantstars hoversright below 500. But confirming which remote flicker of light is themilestone alienworld will be a tricky affair. AtNASA's last count, astronomers had confirmed the discovery of 494 planetsaround alien suns. There are signs of dozens more, if nothundreds, but itwill take time to weed out which of the detections are actual worldsand which aremerely false alarms. Someastronomers now expect that official discovery of the 500thalien planet by January 2011. Thereare four primary techniques currently used to find exoplanets, eachwith itsown pitfalls. Theradial velocity method looks for repeated wobbles in a star's movementsthat aresigns of a planet's gravitational pull yanking it back and forth. However,if a planet has very little mass, it hardly exerts much of a pull ? ifanastronomer is trying to detect something like an Earth-size planet, thenoiseor static in the data can be mistaken for a planet. Overcoming thisproblemlargely requires measuring the star over and over and over again, saidastrobiologist Alan Boss atCarnegie Institution ofWashington. "Thatcan take a lot of telescope time, which can be very, veryexpensive," said planetary scientist Sara Seager at the MassachusettsInstitute of Technology. "One night of time at the Keck telescope cancost$50,000." Thetransit method looks for dips in a star's brightness whenever a planetcrossesin front of it. The problem is that if the star under observation is inmutualorbit with another star, it's that other star that could lead toregular dipsand surges in brightness. Anothertechnique, called the microlensingmethod, looks for distortions in light resulting from thepull of gravity.The gravitational field of a planet can have a measurable effect onlight thatpasses by it. However,this occurs only when a star with a planet happens to line up withanother star? a brief event that never happens again, "liketwo ships passing in the night," explained astronomer Geoffrey Marcy atthe University of California at Berkeley. Thedifficulty in reproducing results can make microlensing hardto rely on, although therehave been solid examples of microlensing that overcame any doubts. Astronomersalso may directly image the light from an exoplanet. "Thedown side there is, how do you know if that candidate is a planet or afaintstar?" Marcy said. "Faint stars look a lot like glowingplanets." Thereis no exoplanet list formally sanctioned by the InternationalAstronomicalUnion, the body that assigns official designations to celestial bodies. Instead,there are only unofficial lists maintained by researchers in the field,such as astrobiologist Jean Schneiderat the Paris-MeudonObservatory and astronomer Jason Wright of the University of CaliforniainBerkeley. Thereare also no hard and fast rules as to whether a candidate should bedeclared anexoplanet; each researcher and group has its own preferences, Schneidersaid. To get others toaccept their results,scientists often wait until the probability that their results arefalse alarmsfalls below 1 percent or so. Thestandard way that the field confirms the report of a planet is throughitsacceptance by knowledgeable referees into a scientific journal. Still,as manyas 50 to 100 exoplanets were revealed in talks, only to wait yearsbefore theirappearance in a journal. The discoverers may simply have been too busydoingactual work to write up the papers, Schneider explained. Inaddition, even after publication, a few exoplanets have been retractedas falsealarms ? "five to 10 since 1989," Schneider estimated. 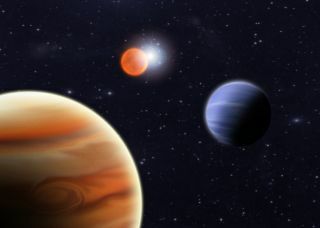 "Myresearch group publishes data on an exoplanet when thefalse alarm probability drops below 1 percent, which means about 1percent willbe wrong," Marcy said. "There's always a chance to be wrong, and asscientists we try to calculate what that probability is and present itopenly." "There'salways a chance there's a few errors in data to makesomething look like a planet," he added. "This can happen to anyone ?just one of those things that happens when you're pushing a frontier,pushinginstruments to their bitter limits. This kind of astronomy is hardwork, andthere are lots of ways to make a mistake. A number might slip through,butthey're generally corrected in a year or two." Anotherpossible point of confusion is the fuzzy boundary that separates aplanet froma "brown dwarf" ? a large gaseous body, more than 13 times the massof Jupiter, that failedto become a star. "Something 20 Jupiter masses and below islikely aplanet, but there's ambiguity there," Schneider said. Allthese concerns might give the impression of a list ofpublished exoplanet being a bit of a mess, but overall, Schneidercontended, only1 or 2 percent of these discoveries are unclear so far. "Thereal acid test in the field is getting two methods todetect an object ? for instance, a radial velocity signature plus atransitdetection," Boss said. "There are about 100 of such absolutely,positively identified planets so far." Inthe end, "there is no real honor roll of planets, no real way to saywhichthe 500th planet will be," Boss said. Still,while it has taken scientists roughly 15 years to confirm the detectionof thenearly 500 planets known so far, the pace promises to grow rapidly. NASA'sKepler mission, a space observatory surveying a large sample of starsas itorbits the sun, revealed in June that it had detected more than 750possibleexoplanets using the transit method within its first 43 days ofoperation. "Kepleris beating us all by a million miles," Marcysaid. Manyof the candidates Kepler discovered are now getting verifiedwith radial velocity confirmations. "On Feb. 1, we'll announce all ofthem? a huge avalanche of exoplanet candidates," Marcy said. "Thedays of having to have perfect exoplanets are goingaway," Seager noted. "We're going to publish so many planets thatwe're not going to be able to validate all of them. Instead, we'll haveso manywe can start studying them statistically in groups." Evenwithout Kepler, there are roughly 100 exoplanet candidates thatresearchers areworking hard to confirm, Marcy said. "Wecould well hit 500 on Jean Schneider's list by January," Boss said. POLL:When Will Humanity Truly Find an Alien Earth?